Online storage and sync services solve a lot of problems for users who work and play on multiple devices. The premise is simple: store all your data in one place that can be accessed from wherever you are, using whatever device you have with you. But which one of the big three cloud storage players is best for you? Storing files online adds convenience and productivity for users who travel, or use different computing devices in different places. No more forgetting an important business document at home; emailing files to yourself; or keeping track of multiple copies of a file on different devices. The idea is that as long as you have an internet connection, you have access to your files. It doesn’t matter if you’re using your home or office desktop, your road warrior laptop, a tablet, or a smartphone. The latest version of your document, spreadsheet, presentation, music, image or video is ready and waiting to be accessed. But the proliferation of online storage services means a host of confusing features and prices for large amounts of storage. Here, we look at three online storage services – Google Drive, Microsoft Skydrive, and Dropbox – to see how they stack up in several feature sets that matter to users. All three services give you a fair amount of free storage space, and charge a fee if you need more. Google Drive provides 5 GB free; Skydrive, 7 GB; and Dropbox, 2 GB free of charge. If text documents are all you need to sync, those free allotments are enough for most people. But music and video files eat up space quickly, so you may need to buy more space. For a total of 100 GB, Google Drive will set you back $59.88 per year. Skydrive charges $50/year for 100 GB. Dropbox wants $199 a year for 100 GB. Winner: Skydrive offers the most free storage and the cheapest additional storage. All three services let you share files with other users by creating hyperlinks to files and sending them to your acquaintances. With Dropbox, you have to create a “shared folder” if you want others to be able to edit documents. Skydrive lets you make a file editable by some users and read-only by others. Google Drive lets you make a file editable by all or read-only by all. Dropbox and Skydrive will create galleries of photo images that your friends can peruse. Google Drive does not have that amenity yet. Winner: Skydrive offers the most options for sharing. Google Drive not only indexes file names but also the content of about 30 different file types, so you can search for a file that contains a phrase or key words. Dropbox searches only file names. Skydrive can search the content of Microsoft files (Word, Excel, and Powerpoint) but won’t even index the file names of other file types such as JPGs. Dropbox offers its agent software for Windows, Mac, and Linux computers, plus phone apps for Apple and Android devices. Dropbox also support Blackberries and direct Web access to your files. Google and Microsoft support Windows and Mac computers. Micrsoft does not have a Skydrivie agent for Windows XP, nor does it support Android, but there is an iOS version. Google does not have iPhone or iPad apps, but it’s supposed to be coming soon. You can use the mobile version of Google Docs in the browser. Dropbox lets you restore files that you have deleted or overwritten. It keeps older (modified) versions of your files up to 30 days if you have a free account, or indefinitely if you have a paid account. Skydrive gives you the option to compress larger image files to save transfer time and storage space. Google Drive offers to convert your files into Google Docs format, which facilitates collaboration in real time. Also, files stored in Google format don’t count against your storage space allowance. Mac users maybe wondering why I didn’t include the iCloud service in my comparison of cloud storage services. Simply put, it’s not in the same class as the others. True, it offers 5GB of free online storage space, with a paid option of $100/year for 55GB. But iCloud was designed primarily as a backup tool for iTunes. It will store and sync your Itunes music, apps and books. It also automatically backs up your email, contacts, and calendars, on Mac and iOS devices (iPhone, iPad, iPod). This also works on PCs, but only if you use MS Outlook. The biggest limitation of iCloud is that you can’t throw just any file in there. Aside from the data I mentioned above, only files created in the Pages, Numbers, and Keynote apps (on a Mac) can be synced to iCloud. For mobile users, only iOS devices are supported. And it’s highly unlikely that Apple will ever add support for Andrdoid or Windows mobile devices. Overall, Google Drive's capabilities make it the best choice for both PC and Mac users who want to store lots of files online, particularly documents. The advacned search, easy collaboration and feature-rich editing tools put it over the top, in my estimation. But as the French say "Vive la différence!" If SkyDrive, Dropbox or iCloud has a specific feature that's really important to you, or the tool fits into your computing environment better, then go for it. All of them are secure, high-quality cloud storage options. 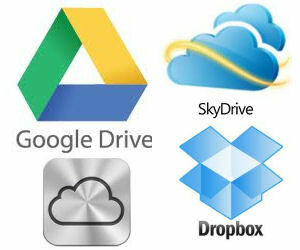 Most recent comments on "Skydrive, Google Drive, or Dropbox?" Have used Dropbox and it makes it quite easy to share files between my home PC, office PC, work laptop, and netbook computers. Don't have to worry about whether I am working on the latest file. Sharing files is easy. Getting friends to sign on has gotten me several more free gigabytes of storage space. I'm quite pleased with dropbox. Why limit yourself? I use all 3 plus Comodo. What if one of the systems is having a problem and you need to see a file- by using a variety of companies would mean you will have a file when you need it. Hi guys! Just a word of warning if you'd like to use Dropbox w/Android devices. At the latest version update, Dropbox pooped big time, and moved its' folder where the Sun never shines and most of the Android apps can't find it.. I use to sinc my e-books on Nook colour Aldiko reader w/PC.. now it is a tedious and manual labor requiring enterprise… Same goes for the most of other Andrid apps [Galery etc.]. Doesn't look like Dropbox is willing to do anything about this, despite cries on the Forum.. Using The Box now.. very simple. I find Ubuntu One very good as well. But my favorites are the ones that do not require any software (software optional). Having access via web is very convenient at times. Amazon is one service that does not require software. There are a few others as well. My new HTC EVO 4G LTE came with 25 GB FREE for two years for Dropbox. I am assuming Sprint or HTC made an agreement with them, since the Sprint version of the phone is the only one that supports a mini sd card. Those on AT&T or Tmobile need some additional space. I've seen plenty of comparisons of the main players, but wonder why everyone ignores Sugarsync? It seems to have most, if not all of the features of the others, but adds the ability to use any directory on your device, not just one directory in the way DropBox and Google Drive do. To me this is important as I have my data structured the way I want it and don't have to move it around or create copies to suit the software. I use all of them. I too have the 25GB free on SkyDrive. I even use Box. Basically only my resume sits on each. I use SkyDrive mainly to transfer files off of my Mac and later backup the files. There is one thing that you did not mention about iCloud (I use that the most since I do have a Mac). If you use iTunes Match, you can load up to 20,000 songs concurrently (you can take songs in and out of iTunes Match if you have more) and it doesn't count against your free 5GB. So, not quite true about primarily for iTunes. "The biggest limitation of iCloud is that you can’t throw just any file in there." It is simply not true, you can put any type of files there. As mentioned above, my resume sits on all on-line storage. My resume is in Word 2003 and Word 2010 (Windows 7 versions) is currently in iCloud and I put it there from a Windows 7 system. I would not put a iOS/OS X specific file for my resume. I even put .exe and .zip files there. Not sure where you got your information from. However, I do agree, SkyDrive is the best since it is available on iOS, Android, Mac, Windows. iCloud also has the limitation of only working on Windows 7 and Windows 8. If you are on Linux or Windows XP or Vista, it won't work. So there are limited platforms. This makes SkyDrive the clear winner. I've been using Google docs both for personal and work issues. Also I'm grateful to Google for helping me write my diploma (my mentor was abroad, so all corrections were made in Google docs)! It's also simple in use. Have not yet delved deep into Google Drive, but in my opinion he is worth considering when choosing a cloud storage. Does anyone have any thoughts about PogoPlug? I purchased one but have not activated it yet. Did I waste my money, or is there a distinct advantage to keeping all data local?? I use Dropbox to share spreadsheets which multiple people update, therefore the 'restore previous version' feature is critical in case of error. I can also see who's edited which files - I don't know if the other products do that. The comment about only being able to have one folder puzzles me - yes only one Dropbox folder, but I have more than one email address/Dropbox account, which have access to different sub-folders. I sometimes use an office computer and have that linked to an account which can't access my personal folders. I love Dropbox; it's very simple to use, which is important as some of the people I share my files with are not very computer literate. I am very happy with Dropbox but have just installed Google Drive to get more free space, as I am a cheapskate. That said, Google is becoming too big for its boots and we should intuitively prefer smaller players. Like Dropbox. For the same reason I will not switch from Firefox to Chrome. I was just to go for Google Drive but then changed my mind.I learned that Google converts files to Google Docs. In the process, formatting is modified. Since all my files are in Microsoft Word, I decided to go for Skydrive. Now my files will not be changed even slightly. I use both Dropbox and Google Drive, but for different purposes (I have a SkyDrive account, but it is awkward to access, so I don't use it.) My wife and I travel a lot, and I use Dropbox (2GB limit) as a kind of travel briefcase, with folders for different purposes, e.g., 1. temporary trip folder (reservations, etc); 2. permanent travel (encrypted passports, drivers licenses, mail list, international shot records, insurance, frequent flyer numbers, etc. ); 3. camera manuals; 4. Misc. I use Google Drive extensively for shared work documents. While Google's spreadsheet is no match for Excel, it does get the job done -- though more slowly and a bit more cumbersomely. I was just to go for Google Drive but then changed my mind.I learned that Google converts files to Google Docs. In the process, formatting is modified. Since all my files are in Microsoft Word, I decided to go for Skydrive. Now my files will not be changed even slightly." Go to the "Settings" icon (gear-shaped) on the Drive page and look for "Upload Settings." Make sure "Convert uploaded files to Google Docs format" is unchecked. I loaded Google Drive and at first it worked fine. Then, I started getting a message that started with "Google Drive has encountered a problem and needs to close." It seems to be in some way associated with an error loading a file named Python DLL. I tired restarting Google Drive and got a Drive page in Hungarian. I'd still get a needs to close message when I restarted my PC. Next I removed Google Drive and reloaded it. No difference. At one step in looking at various Google Drive pages there was an option to send a message. I asked for help. No response. Now I'm undecided as to my next step. Think I'll wait a few days. maybe there will be a comment here. All in all the Cloud seems a bit dark and rainy for me. The concept is good so I'll not give up. I opened a folder in Dropbox to share photos of new granddaughter with the other grandparents, and ever since I have been finding my photos coming and going from the folder without my having any control over it... In desperation I deleted the shared folder and all its contents, and opened a new folder that I am not sharing - and lo and behold, the old folders keep coming back to haunt me! No idea who is replacing all the pictures, as I sit and watch my computer telling me that 198 pictures have been added. If you can't help me control my Dropbox I'm going to have to find an alternative - help please!